It may be Winter, but you can still bask in the bright light of Summer. Put away your cask of Coppertone and your frequent fryer card from the local tanning tank. Lemons, limes, oranges, and grapefruit can lift any dish, dessert, or drink from dull to delightful. Use the zest for deep flavor. Squeeze out the juice for a zesty zing. You can always find lemons and limes at the grocery store, but orange ya glad that some stores offer seasonal treats, even in the coldest months? 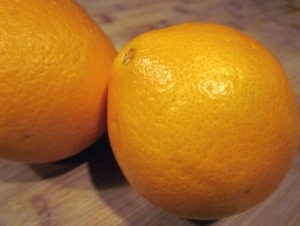 At the Fresh Market I bypassed my beloved (and in season) Meyer Lemons (Gasp!! 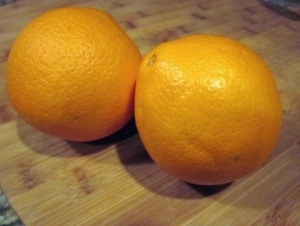 ), and grabbed some Cara Cara Oranges. They’re named for Hacienda Cara Cara in Venezuela, where they were first discovered in the 70’s. These are from California where the season runs from December through April. 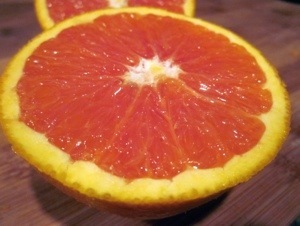 Outside, they look like your typical orange, but cut them open and you’ll be wondering if you grabbed a grapefruit. They are gorgeous. I mean that. The stunning ruby-red center is a gem all in itself. And get this, they’re seedless! 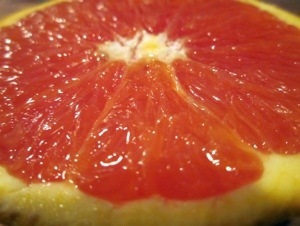 The juice is sweeter than a traditional orange orb, and it’s not as acidic. The flavor goes far beyond the traditional and gives you hints of cherry, cranberry, and even blackberry. I want a Cara Cara Orange tree in my yard. Mostly so I can say Cara Cara Orange a lot. To really highlight the beauty of these babies, you can make surpremes. This is a certain cut, not a girl group from the 60s. Say it… suprems… not supreeeems. 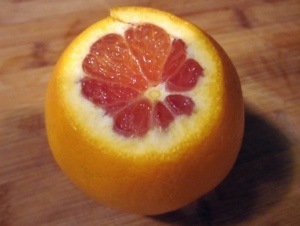 To do this, cut the top and bottom off the orange. 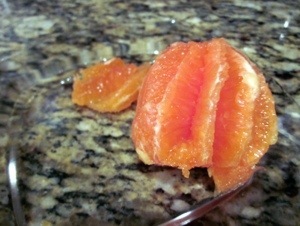 Then, using a sharp knife, shave the skin down the sides. Then, take what’s left, and hold it in one hand, while you carve out the supremes in the other. 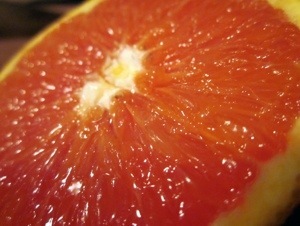 You can see the segments of the orange. They’re separated by thin, white membranes. 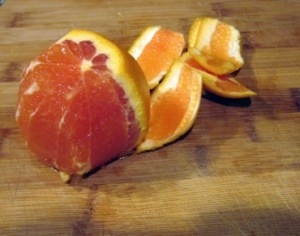 To make supremes, just slice at each membrane, going to the center of the orange. You end up getting sections of the citrus. They’re beautiful. Tiffany & Co. could make dangly earrings with them, I swear. But, rather than going the regular route (I never do that, do I?) and making juice or an ‘ade, or a curd or a jam, I wanted to cook with them. Chef Alex Guarnaschelli (as brilliantly creative as she is sarcastic) recently Tweeted a photo of scallops with Cara Cara Oranges. I took that inspiration and ran with it. I made shrimp and quinoa in a Cara Cara Orange sauce (serves 2). 1 cup of shelled, cooked edamame. In a medium pot, combine the water, one cup of the broth, and quinoa. Grate in one clove of garlic and add 1 tsp. of zest from the oranges. Bring to a boil, cover, and reduce to a simmer. Cook for 15 minutes or until water is gone. While the quinoa does its thing, heat the sesame oil in a non-stick skillet. Sprinkle salt on the shrimp, and toss it in the oil. Cook until pink, about 2 minutes per side. Remove shrimp to a plate. 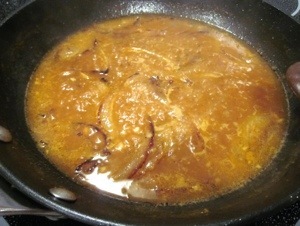 In the pan, add the onion, and brown. Grate in the ginger, and the other clove of garlic. Stir, and cook until fragrant, about a minute. 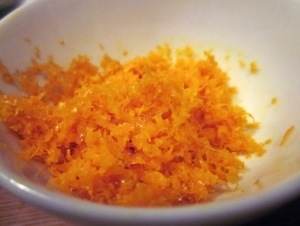 Add the juice of 2 of the Cara Cara Oranges and the remaining zest. Stir. 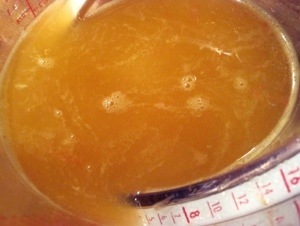 Add in the other cup of broth, and a good pinch of salt. Add soy sauce and Sriracha. Stir. Bring the mixture to a boil, and let it roll for about 3 minutes. Add in the vinegar, stir, and keep boiling for 2 minutes. Reduce to medium heat and cook for about 5 minutes. Strain the mixture. 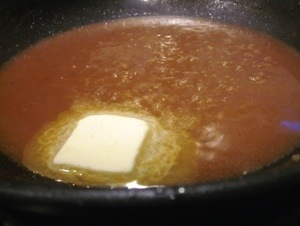 Add the sauce back to the pan, add the butter and a pinch of salt. The butter will give it a silky finish. Toss the shrimp back in the sauce to warm. Fluff the quinoa, sprinkle in some salt, then grab the segmentless orange you have left from making surpremes, and squeeze it into the pot. Stir. To serve, scoop quinoa onto the plate. Make a ring of shrimp on top. Spoon on some of the sauce, enough to create a bit of a puddle around the quinoa. Sprinkle on some edamame (color and protein! ), and surround the mound with arugula. The sweetness of the Cara Caras really plays well with the peppery bite from the arugula. Plus, it looks pretty, okay? Just before serving, set a few supremes around the shrimp and then drop on a few dots of Sriracha (color and a kick!) around on the quinoa and onto the shrimp. This meal was like opening the doors of the Emerald City. Bright green, and so many ingredients of a different color. 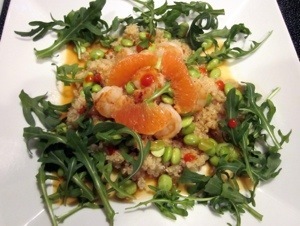 You get heat from Sriracha, a sweet zing from the citrus, and an earthy, somewhat spicy bite from the arugula. 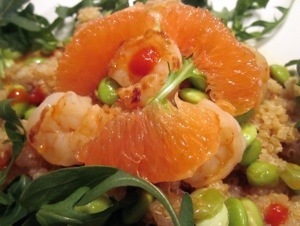 The edamame provides a creamy texture to high light the fluffiness of the quinoa. Go buy some Cara Caras and let them carry carry you away to the light at the end of this Winter. Tip: Substitute citrus juice for vinegar in a salad dressing. Combine the juice of one Cara Cara Orange (or 2 lemons/3 limes), the zest from half the fruit, 1/3 cup extra virgin olive oil, 2 cloves of garlic (grated if whisking by hand), salt, and pepper. Blend or whisk. You could fresh basil, Italian Parsley, or fresh thyme. Or, make it a bit spicy by adding red pepper flakes. This would be great on a salad topped with supremes.